With the Xbox 360 Kinect selling like gangbusters, Sony releases this infographic to demonstrate how its take on motion gaming is picking up speed. Are you convinced? 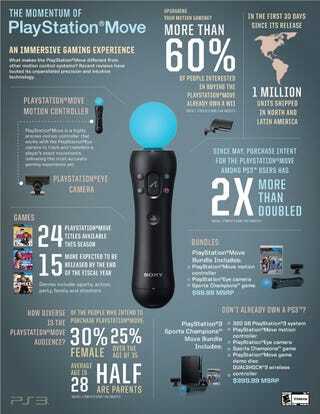 The infographic uses up a lot of real estate discussing people interested in buying a PlayStation Move controller. Intending to buy and purchase intent weigh heavily, but those shipping numbers seem a trifle low. One million shipped in both North and Latin America since launch, and no concrete sales numbers? Taking into consideration the one million units shipped is the same number we got back on October 21, and I'm not sure I'm seeing the same momentum that Sony is.